Begin your personal beauty journey with the right tools by choosing the Real Techniques Starter Set Kit (eyes). 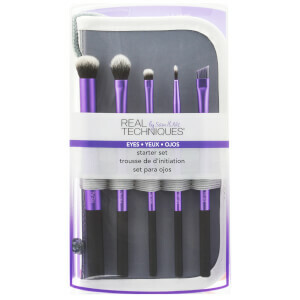 It has been created by professional make-up artist Samantha Chapman, and now these cute metallic purple brushes can be yours. The set includes five brushes: the base shadow brush - perfect for achieving a flawless base for your eye make-up; the deluxe crease brush to ensure your colour reaches every area of the lid; the accent brush to create points of interest and drama on the lids; the pixel point eyeliner brush - a precise tool that enables you to work in high definition; and the brow brush - for the ideal arch and to emphasise your brow, this is the only brush you need. Love these brushes bought them as a starter set for my daughter great price also super for blending. Would highly recommend 5 stars. I am very pleased with these brushes set so I ordered it again. Very good price for quality. Really good and fluffy, especially the really large blending brush. I use that one for my crease color all the time, but also for highlighter, bronzer and powder, I absolutely love it!!!!!!!!!! I don't think I can point out just how much I love this set! I bought these brushes after reading the reviews and was so happy I did! The brushes have really soft bristles and are just perfect for blending... Especially crease and base shadow brushes are my favorites. At first I was a little sceptical as the crease brush seemed really big and I was worried I would smudge the shadow all over my eyelid. Well, that didn't happen, my make up looked gorgeous. This set is just what you need to make a quick everyday make up. Another plus: the color is just fab! I think I am going to buy myself another set, a girl can never have too much brushes. IT BLENDS SO NICE ON MY FACE! CHEAP BUT HIGH QUALITY!!! I have quite a few brushes already and wanted a set that I could pack and take away, but these are better than my existing brushes. I love that there is an online tutorial, which is really great and has got me using all of the brushes in the set every day. 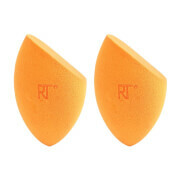 They are lovely and soft, and blend shadow nicely. I'm looking forward to checking out more of the tutorials and will probably end up with more brushes as well! Perfect for everyday makeup - daily use for them all! Wow - I am so impressed with these brushes! I have been eyeing them up for months and finally decided to get them - best decision EVER! I want to highlight two things that make these brushes so good: 1) They are so soft and blend beautifully. At first, I thought the crease brush was way too big, but then I used it and it was so easy to use! Not too big at all! My eyeshadow blended beautifully and in no time at all. 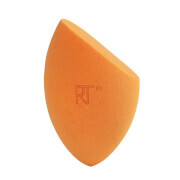 Amazing for creating dramatic looks and a quick brush to use for your everyday day-look. 2) I have really sensitive skin and often my eyelids have been left really sore and red after applying eye shadow. I like to do dramatic looks with lots of different shades and lots of blending but it doesn't always turn out the way I want due to redness. 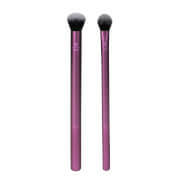 When I used these brushes, there was no redness or soreness at all - they are so soft! And I didn''t feel like I had to spend ages blending the colours, it was so quick! If you're hesitating, all I can say is BUY THESE NOW! !